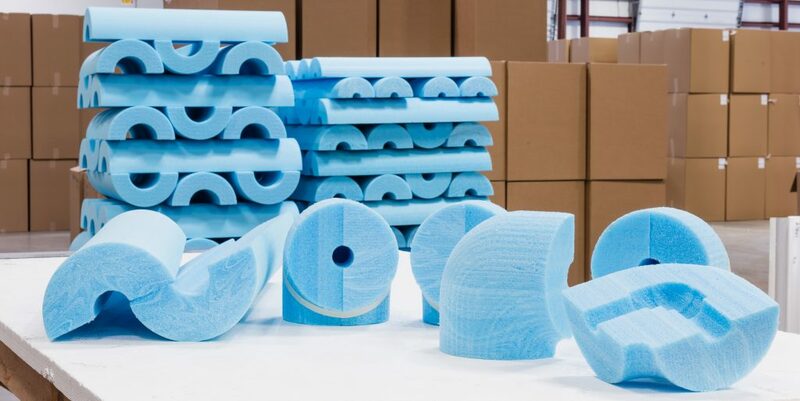 Extruded polystyrene (XPS) is one of the frequently-used insulants in cold-service mechanical insulation applications within the ranges of -297°F to 165°F (-183°C to +74°C). XPS is manufactured by both Dow Chemical (blue) and Owens Corning (pink), among others. The physical properties of each manufacturer are materially different, and must be objectively assessed during insulant comparisons and selection. “XPS is manufactured primarily by Dow® Chemical as a blue rigid foam [XPS Pipe Insulation Billets (XPS PIB)], and Owens Corning® as pink “Pipe Insulation Fabrication Billets”. Excerpts from the manufacturers’ technical literature (paraphrased) communicate that the rigid, closed-cell structure of XPS gives it high compressive strength, low friability, and excellent resistance to water and water absorption from freeze-thaw cycling, allowing it to maintain its superior performance over long periods of time. It is manufactured in thick seamless buns that easily accommodate common pipe sizes. Larger pipe sizes may trigger the need to bond layers of insulation together prior to fabrication into pipe shapes. XPS is available in several densities, each with varied properties – – particularly compressive strength. The chemical compositions of XPS as manufactured by different companies results in different physical properties. Note 1: ITW Insulation is the exclusive supplier of Dow XPS PIBs.